The integrated bridge systems market is estimated to be valued at USD 5.08 Billion in 2016 and is projected to reach USD 5.60 Billion by 2021, at a CAGR of 1.97% during the forecast period. The base year considered for the study is 2015, and the forecast period is from 2016 to 2021. The objectives of this study are, to analyze the integrated bridge systems market, along with statistics from 2016 to 2021, as well as to define, describe, and forecast the integrated bridge systems market on the basis of platform (commercial ships and naval warships), size (small ships, medium ships, and large ships), and components (small ship integrated bridge system components, medium ship integrated bridge system components, large ship integrated bridge system components). These segments and subsegments are mapped across major regions, namely, Asia–Pacific, North America, Europe, and the rest of the world. The report provides in-depth market intelligence regarding the market dynamics and major factors influencing the growth of the integrated bridge systems market (drivers, restraints, opportunities, and industry-specific challenges), along with an analysis of micromarkets with respect to individual growth trends, future prospects, and their contribution to the integrated bridge systems market. The report also covers competitive developments such as, long-term contracts, joint ventures, mergers, new product launches and developments, and research & development activities in the integrated bridge systems market, in addition to business and corporate strategies adopted by the key market players. 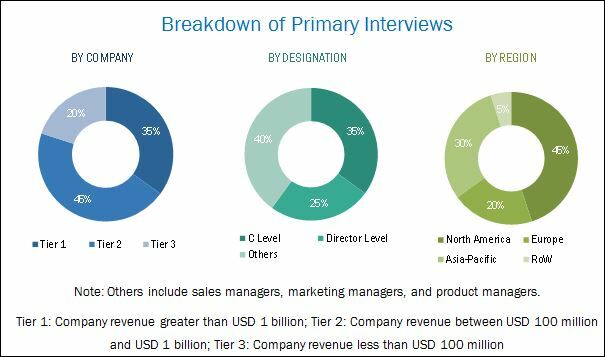 The integrated bridge systems market comprises product developers and manufacturers such as, Northrop Grumman Sperry Marine (U.K.), Raytheon Anschütz (Germany), Rolls Royce (U.K.), L-3 Communications Mapps Inc. (Canada), and FURUNO Electric Shokai Ltd. (Japan), among others. These companies offer advanced technological systems, products, and services. They also provide a broad range of management, engineering, technical, communications, and training services. 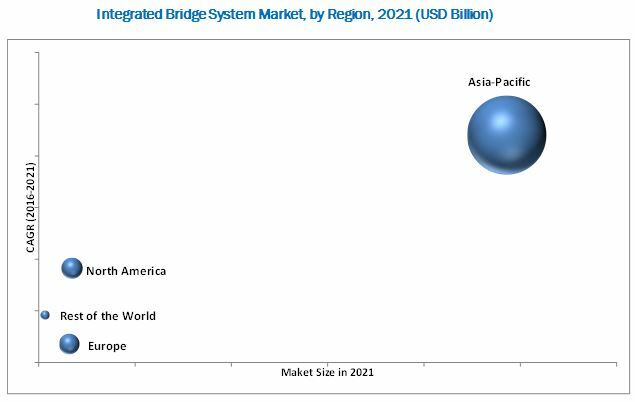 The integrated bridge systems market is projected to grow from USD 5.08 Billion in 2016 to USD 5.60 Billion by 2021, at a CAGR of 1.97% during the forecast period. Factors such as, the increasing trend in seaborne world trade, increasing compliance in maritime safety norms and the growth in maritime tourism are driving the integrated bridge systems market. Based on platform, the integrated bridge systems market has been segmented into commercial ships and naval warships. The naval warships platform segment is projected to grow at the highest CAGR during the forecast period, primarily driven by the rising investments in naval systems equipment by the developed and emerging economies. The integrated bridge systems market on the basis of size, has been segmented into small ships, medium ships, and large ships. The large ship segment leads the market and is estimated to continue to lead during the next five years, as seaborne trade is expected to grow further in the coming years. Based on component, the integrated bridge systems market has been segmented into small ship integrated bridge system components, medium ship integrated bridge system components, and large ship integrated bridge system components. The large ship integrated bridge system component segment leads the market and is estimated to be the highest growing segment during the next five years, as the construction of large ships across the world is expected to increase. Software plays a vital role in the integrated bridge systems market. This market has been segmented into Synapsis NX, K – bridge sensor integrator (SINT), Visionmaster FT, Napa Logbook, Naviplanner 4000. The software developed by the major players is listed according to the different applications. Based on module, the integrated bridge systems market has been segmented into the radar system, communication console, and ECDIS system. These modules are sub–systems which contain various components of an integrated bridge system. Factors such as, digitalization making ships vulnerable to cyber threats, and the shortage of qualified professionals in the marine industry may inhibit the growth of the integrated bridge systems market. Key players profiled in the integrated bridge systems market report include, Northrop Grumman Sperry Marine (U.K.), Raytheon Anschutz (Germany), FURUNO Electric Shokai Ltd. (Japan), Transas (Ireland), and L-3 Communications Mapps Inc. (Canada), among others. New product launch was the key strategy adopted by the industry players to achieve growth in the integrated bridge systems market. This strategy accounted for a major share of the total growth strategies adopted by the leading players in 2015. For instance, in September 2015, Transas Marine launched e-Navigation technologies at the Neva Exhibition held in St. Petersburg, Russia, where they demonstrated the implementation of the e-Navigation system and its integration with the port VTMS and fleet management system. 14.5 Furuno Electric Co. Ltd.
14.14 L3 Communications Mapps Inc.